What is the smallest radius of a conduit you need to buy? 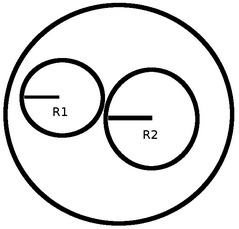 In other words, given two circles, what is the smallest radius of a third circle that circumscribe the other two? In the first line there is an integer T (T ≤ 10000), indicating the number of test cases. On the only line of each test case we will have the two integers R1 and R2 indicating the cables radius. The integers will be positive and all the math will fit in a regular integer of 32 bits. In each test case, output the answer in a single line.